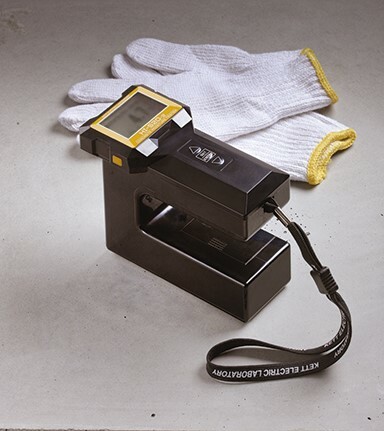 This new portable device provides instant, non-destructive testing of drywall, concrete, mortar and other dense samples, in the field, in the lab, and on a process line. Villa Park CA -- January 22, 2019 --Kett, the world’s leading manufacturer of award-winning portable handheld moisture analyzers and coating thickness analysis instrumentation, announced today the introduction of the HI520-2, a new analyzer that provides instant moisture measurement of Drywall (gypsum board), Concrete, Mortar and other dense solids. The HI520-2 is the latest instrument innovation from Kett, a leader in moisture and organic composition measurements for more than 65 years. The HI520-2 is designed for use in field (in-situ), laboratory, near-line process QA/QC applications where quick, accurate determination of moisture content is required. Kett will be exhibiting the HI520-2 at the 2019 Pittsburgh Conference (Pittcon) March 19-21 in Philadelphia, Pennsylvania as well as other trade shows throughout the year. This simple-to-use device allows users to measure the moisture content of individual dense samples. Tests are completed without sample preparation. The HI520-2 is factory-calibrated for Concrete, Lightweight Concrete, Gypsum (drywall) board, Mortar, and Calcium Silicate board (CSB). To measure a sample, the user selects the calibration, places the instrument on the surface and the moisture value is instantly displayed on the large display. In addition to factory calibrations, the HI520-2 allows for seven user calibrations and provides two “raw” measurement modes, allowing samples of almost any dense material to be quickly and easily compared. Up to 1000 measurements can be stored and output, with date and time, via optional software. Automatic temperature compensation improves accuracy and upper alarm limits make it simple for a user to quickly identify and sort out of limit samples or locations. For a complete brochure on this exciting new addition to the Kett product line, visit: www.kett.com/files/brhi52002.pdf. Kett is recognized as a worldwide leader in measurement instrumentation, and is the only manufacturer making more than 100 instruments for moisture meters, composition measurement and grain processing measurement. Models are available for handheld, desktop and inline/online continuous measurement applications.